Has Jesus’ childhood home been discovered? [by Dean Smith] In a Biblical Archaeological Review article, archaeologist Ken Dark reports he may have found Jesus’ childhood home in Nazareth. According to the Bible, Jesus was born in Bethlehem (Matthew 2:1), raised in Nazareth (Luke 4:16) and eventually moved to Capernaum (Matthew 4:13) where He started ministering. In 670 AD, an Irish Monk named Adomnan from Iona wrote a document called De Loctis Sanctis that discussed the pilgrimage of Bishop Arculf to Nazareth. 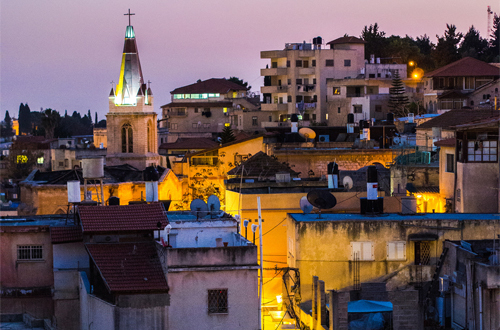 During his journey, Arculf visited a church at the site of the home where Jesus grew up. According to Adomnan, Arculf provided a brief description of its location stating in addition to the church, the house was located between two tombs and there was a spring nearby. The Bishop also described a second church — the Church of the Annunciation — being close to this house. Dark believes they have found the home described by Arculf. It is located beneath a building used by the Sisters of Nazareth Convent. Evidence of this ancient house was first discovered by nuns in 1880. In 2006, Dark started doing extensive archaeological work at the site. He eventually uncovered a home dated to the first century that had been partly built into a limestone hill. It had a number of rooms and even a staircase. It still had its original window sills and a doorway. The team also found artifacts indicating a Jewish family occupied the home. However, it was the discovery of two tombs, along with the remains of ancient church with a spring, that caused Dark to conclude this was the house described by Bishop Arculf. Across the street is the Church of the Annunciation which was the second church mentioned by Adomnan. Other religious buildings were built at the site suggesting it had some significance, which over time was eventually lost. Though Dark says we can’t be absolutely certain this is the childhood home of Christ, those who lived closer to the time were convinced it was. Dark believes it was probably Christ’s home. Today, historians know the very house where famous playwright William Shakespeare was born and raised. It is a restored, half-timber building in Stratford-upon-Avon, Warwickshire, England. Shakespeare was born in 1564, nearly 600 years ago. Because of his fame, people identified Shakespeare’s home as being significant and a record of the home’s lineage was passed down. Similarly, the home in Nazareth identified in 670 AD as Jesus’ home was also by that time 600 years old. Similar to Shakespeare, Jesus’ fame would have given the building significance that others may have passed along. Next PostIs the Muslim Dome of the Rock really sitting on the original site of the Jewish Temple?